The old carousel at the entrance to Prairie Village may be going away soon, if members of the Prairie Pasque Questers have their way. But it will only be gone for a time. Cecelia Wittmayer, president and public relations officer of the local Questers, and Mickie Kreidler, vice president, are embarking on a campaign to raise funds to refurbish and restore the carousel. The Questers is a study club devoted to fostering an appreciation for antiques and their collection. It was started in 1944 by Jessie Elizabeth Bardens and has since spread around the world. “A major objective of our group is to encourage the preservation and restoration of existing historical landmarks,” said Wittmayer. Gwen Larsen is secretary and historian of the local club and Rae Lynn Maher is treasurer. Last summer, the local Questers contacted Carousel Works, a firm in Mansfield, Ohio, whose sole business is the manufacture and repair of carousels. Jim Jones, a 23-year veteran of the business, came to Madison to view the Prairie Village unit. Jones admitted that he had never seen a machine like the one in Madison. The carousel at Prairie Village dates back to around the turn of the century and was manufactured by the firm Herschell-Spillman in New York between 1903 and 1920. Jones said he would place the actual manufacture of the machine closer to the 1903-05 time period. For years, the carousel toured towns all over the Midwest as the centerpiece of the Thomas Shows, a carnival based in Lennox. Sometime prior to the 1950s, the ride was replaced with a newer machine and the old merry-go-round was dismantled and put into a barn in North Dakota. The harsh North Dakota winters were hard on the old machine, but in the mid-1950s, efforts were begun to restore the machine. The job fell to Floyd Caryle, who took five years to reassemble and restore the carnival ride. In 1966, Joe Habeger, one of the original founders of Prairie Village, and others contacted Art B. Thomas to see if the carousel could be purchased. 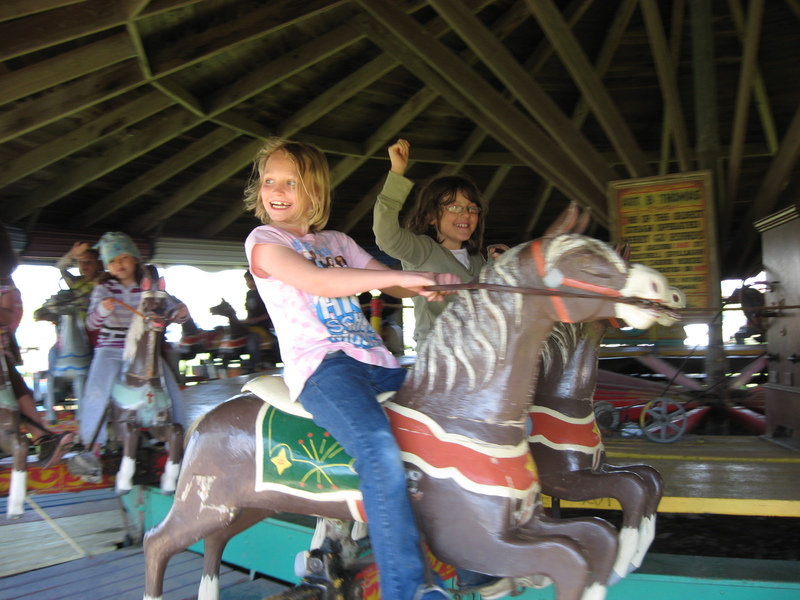 Thomas agreed and the historic carousel has been a fixture at Prairie Village ever since. Several improvements were made to prevent damage to the ride over the years, including building a roof over the carousel and a cover to keep rain and snow from reaching the mechanism during harsh weather. But the constant operation of the ride, which now has been switched from steam to gasoline power, has taken its toll. Karen Becker, who several years ago served as manager of Prairie Village, and her family instigated the latest efforts to restore the ride. She got the local Questers interested in the project. Kreidler wrote a grant asking the state Questers to provide money to have Jones evaluate the machine. In June, the state Questers will have their convention in Madison and it is expected the project will be discussed. In the meantime, the local club will pursue fund-raising efforts in the hopes of obtaining approximately $300,000 that it will take to restore the Prairie Village carousel. Once the proper funding is obtained, the Carousel Works crew will come to Madison, disassemble and transport the ride to Ohio, and then do a complete restoration. Jones said it could take up to a year to complete the work. Once refurbished, the carousel will be returned to Prairie Village and reassembled. “This will not be a museum piece, although it certainly is of that caliber. Rather, it will be returned to the service for which it was originally built — that of a carnival ride. Although the actual restoration cost is far less than $300,000, the remainder of the money will be used to transport the ride to and from Ohio and hopefully build a new cement foundation under the ride. The carousel now rests on a dirt floor. Jones declined to estimate the value of the carousel in its restored condition, but he said that because there are only two or three in existence, it is very rare. “Certainly, Prairie Village and the Madison community can be proud of what they have. Many towns, including Mansfield, Ohio, where I live, used carousels as sort of a calling card or a local attraction,” he said. Allen Herschell, a Scotsman born in 1851, is thought to have built the Prairie Village carousel. He came to this country in 1870 and with partner James Armatige began the manufacture of steam engines. While seeking medical treatment, he reportedly saw a carousel in operation and decided to build one himself. His partner didn’t buy into the idea, but Herschell went ahead anyway and took two years to build his first merry-go-round. During the 1890s, his firm built over 300 carousels, selling and shipping them throughout the world. The ride was extremely popular, but the economy took a turn for the worse in 1899 and eventually the firm failed. Reorganized as the Herschell-Spillman Company, the firm prospered and became America’s premier carousel builder, staying in operation until 1955. Earliest examples of the carousel go back to 1800, but mass production of the rides didn’t begin until 1860 when the Dentzel brothers, German wood carvers, came to this country. The carousel animals, like those on the merry-go-round at Prairie Village, are made by gluing together blocks of basswood, cottonwood or popular, then carving them into various animals. The horse figure is the most popular, but some rides have lions, tigers and even sea creatures. Painting and attaching saddles and other trappings come next. Rides today usually have animals made of fiberglass and other materials. Wittmayer and Kreidler hope to be able to raise the necessary funds to restore the Prairie Village carousel.Jones said one of the most common approaches is to have community groups or businesses adopt a horse figure on the ride. The Questers would also like to see school groups and children get involved in fund-raising. The theme being kicked around to help restore the local carousel is “You’ve Got A Ticket To Ride.” Plans are also being explored to assemble and publish a cookbook with proceeds going toward restoration of the carousel. The Carousel at Prairie Village may be restored if the local Questers can raise funding for the project.